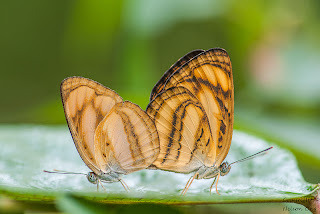 ButterflyCircle member Nelson Ong chanced upon this mating pair of Perak Lascar recently. The species is usually found more regularly in back-mangrove habitats where its caterpillar host plant, Dalbergia candenatensis grows commonly. However due to the species having at least two other alternative host plants, found mainly in secondary forests, the species has a wide distribution, but prefers to remain in the vicinity of forested habitats. Like its lookalike cousins in the genera Pantoporia and Lasippa, the Perak Lascar is typically orange and black striped in appearance. The distinguishing feature of this species is the two pale orange submarginal lines on the forewing. The species has a weak gliding flight, but is skittish and not easy to approach.